This serie of products allows to integrate some DALI & DALI-2 devices into a Modbus network. The HD67842-B2 is a DALI / Modbus Master Converter so you can connect a DALI net ( like a light system, Sensors etc.. ) with some Modbus slaves in order to exchange informations between the nets. The HD67843-B2 is a DALI / Modbus Slave Converter so you can connect a DALI net ( like a light system, Sensors etc.. ) with a Modbus Master ( like a PLC ) in order to exchange informations between the nets. The HD67844-B2 is a DALI / Modbus TCP Master Converter so you can connect a DALI net ( like a light system, Sensors etc.. ) with some Modbus TCP slaves in order to exchange informations between the nets. 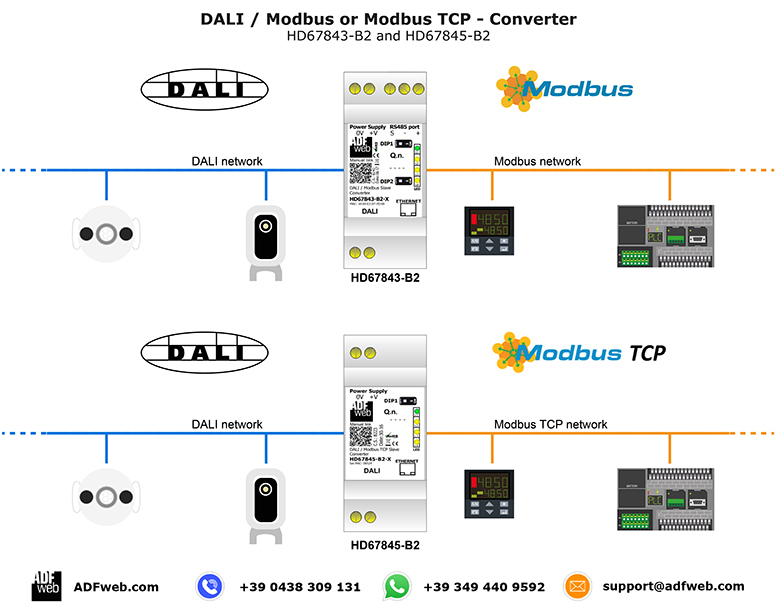 The HD67845-B2 is a DALI / Modbus TCP Slave Converter so you can connect a DALI net ( like a light system, Sensors etc.. ) with a Modbus TCP Master ( like a PLC ) in order to exchange informations between the nets.